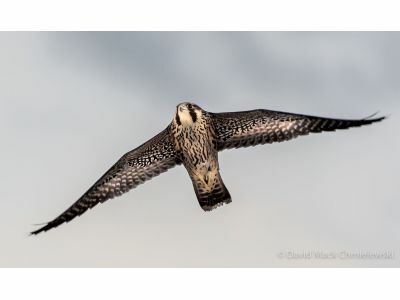 It is with a heavy heart that we report that the young male falcon (Black 64/Blue R) who had such a strong release on Friday hit a bank of windows at the WMU School of Medicine and died from the impact. He was flying well and spending much time in the air with his brother for several days. The young male (Black 63/Blue R) is flying very well and is successfully grabbing food from his parents in midair. The young female (Black 24 / Blue Z) is still in rehab and she is flying well. We hope she can return home soon.